Welcome to Hazel Motors Limited. We are an established service garage located in Dale Street, Chatham - Kent. We have been serving the general public for over 49 years and have established ourselves as a friendly, reliable and professional garage. 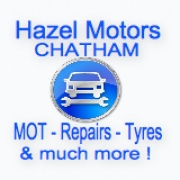 YOUR LOOKING FOR HAZEL MOTORS ! In the modern world it is hard to find efficiency and common courtesy, and we as family run business appreciate the differing needs of each of our customers. We focus our attention not just on vehicles but also on the people, tailoring our service individually to each customer to ensure both your vehicles needs and your needs are attended too. My family has been dealing directly with Colin at Hazel Motors for over 20 years & in fact prior to that with his father totalling over 40 years! Good honest, fair, quality work is the name of the game with this company - always recommended! I always use Hazel Motors even though it's about a 40 mile round trip and back as all the staff are very competent and friendly. Friendly greeting. Vehicle taken to MOT bay right on time. Was asked for hot drink whilst waiting. MOT tester was courteous and polite. Vehicle returned to front of premises. We always get good honest service and everyone is very efficient and polite. Would not go anywhere else with cars. 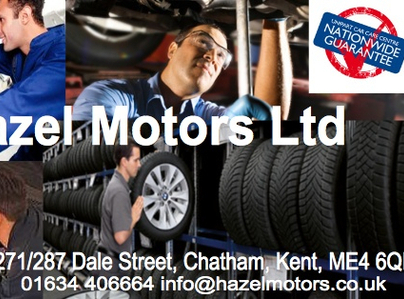 We have always found Hazel Motors to be professional, trustworthy and reliable at all times. Brought my daughters first car, need MOT and bits repaired on it. Turned up Mon 13/07/15 morning. Spoke to Colin, explained issue, they just took vehicle in, kept me informed of time/price which was nice. Staff were helpful and excellent attitude. Repairs all done, vehicle all MOT/repaired. 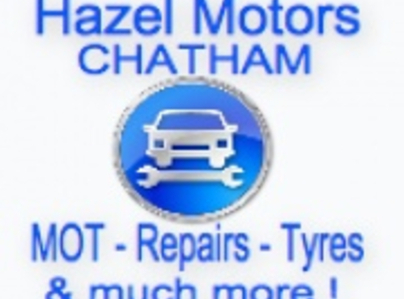 Would recommend Hazel Motors to all friends/family.